Your itinerary includes some good beach time at Bondi Beach and Manly Beach. You'll explore the less-touristy side of things at Munmorah State Conservation Area and Dolphin & Whale Watching. 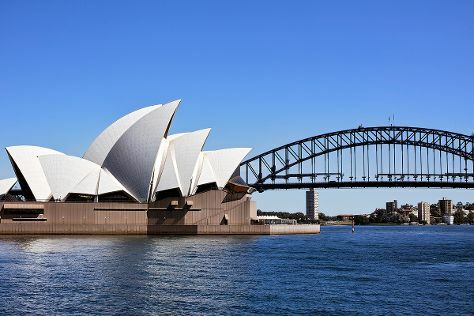 There's much more to do: listen to music at Sydney Opera House, wander the streets of The Rocks, trek along Bondi to Coogee Beach Coastal Walk, and admire the natural beauty at The Royal Botanic Garden. To find reviews, photos, and more tourist information, go to the Sydney trip planning app . San Francisco, USA to Sydney is an approximately 17-hour flight. You can also do a combination of subway and flight; or do a combination of shuttle and flight. You'll lose 18 hours traveling from San Francisco to Sydney due to the time zone difference. Traveling from San Francisco in August, things will get a bit cooler in Sydney: highs are around 66°F and lows about 49°F. Wrap up your sightseeing on the 22nd (Thu) early enough to travel to Kangaroo Island. On the 22nd (Thu), learn about winemaking at The Islander Estate Vineyards, then sample the fine beverages at Kangaroo Island Spirits, and then enjoy the sand and surf at Island Beach. On your second day here, look for all kinds of wild species at Kangaroo Island Wilderness Trail. For ratings, other places to visit, photos, and other tourist information, use the Kangaroo Island travel route site . Do a combination of flight and taxi from Sydney to Kangaroo Island in 5.5 hours. Alternatively, you can do a combination of car and ferry; or do a combination of train, bus, ferry, and taxi. You'll have a few hours on the 24th (Sat) to wrap things up before traveling to Uluru-Kata Tjuta National Park. Step off the beaten path and head to Kata Tjuta and Helicopter Tours. And it doesn't end there: trek along Kuniya Walk, go for a walk through Lungkata Walk, stroll through Uluru Hiking Path, and identify plant and animal life at Red Desert Reptiles. To see more things to do, ratings, other places to visit, and tourist information, read our Uluru-Kata Tjuta National Park tour itinerary tool . You can do a combination of taxi and flight from Kangaroo Island to Uluru-Kata Tjuta National Park in 18.5 hours. In August, plan for daily highs up to 74°F, and evening lows to 42°F. Wrap up your sightseeing on the 28th (Wed) to allow time to travel to Cairns. You'll get in some beach time at Trinity Beach and Palm Cove Beach. Step off the beaten path and head to Tablelands, Waterfalls, and Spanish Castle and Atherton Tablelands. Explore Cairns' surroundings by going to Four Mile Beach (in Port Douglas) and Spas & Wellness (in Palm Cove). Spend the 29th (Thu) among aquatic life with a scuba or snorkeling tour. The adventure continues: head off the coast to Michaelmas Cay and appreciate the history behind Cairns Cenotaph. For photos, maps, where to stay, and more tourist information, read our Cairns trip itinerary planning app . You can fly from Uluru-Kata Tjuta National Park to Cairns in 5 hours. Another option is to drive. Traveling from Uluru-Kata Tjuta National Park in August, you will find days in Cairns are somewhat warmer (80°F), and nights are warmer (63°F). Wrap up your sightseeing on the 1st (Sun) to allow time to travel back home.